I’ve been reading a book: Disney’s Art of Animation. It covers the history of Disney from Oswald (the pre-Mickey Mouse rabbit) to Beauty and the Beast. Well, the entire last half of the book appears to be Beauty and the Beast. The first half is the rest. I wanted to put down some interesting things I found in the book. First, Walt Disney started with Oswald. He was a rabbit that looks a little bit like Mickey Mouse. He was a loved character, and Disney did not properly read the contract, and because of the publisher’s legal work, the publisher owned Oswald and all its success. Mickey Mouse was almost named Mortimer. Steamboat Willie is the most famous and what people think of as the “first” Disney cartoon. But the first was Plane Crazy, and was met with mediocre reception. Steamboat Willie was the first Disney cartoon with sound (but not the first cartoon with sound), and was not simple, clean, nor cheap to make. Art of Animation, Page 17, third paragraph. Pluto’s original name was Rover. His first appearance was a guard dog chasing an escaped Mickey Mouse. He was almost named either Pal or Homer the Hound. Goofy started life named Dippy Dawg. His first appearance was a laughing audience member. It was the mid 1930s when Disney discovered that animation has to be better than real life, after referencing film actors and having the animation appear lifeless. The biggest revelation to me about the history of Disney is that he WAS the father of animation (as is so often repeated). Not little cartoons, but feature length films. The business climate did not support such a vision, and it was against conservative logic to try to make an animated feature length film. You had to have a vision to create something that didn’t even exist yet and enough money to pull it off. And he nearly didn’t. Besides just 2D and even 3D CGI films, if it weren’t for Disney, the CG we’ve been using for live action films would likely be decades behind where we are now. The vision and drive of one can do so much. Disney made “Three Little Pigs,” and it was a success. Then the publishers kept asking for “more pigs.” They made Snow White and the publishers kept asking for “More Dwarves.” This is like Ford, inventor of the automobile said, where if he had asked people what they wanted they would have said “faster horses.” And explains the current state of the game industry. Jiminy Cricket was originally quickly crushed by Pinocchio. End character. After the success of Snow White, Pinocchio, Fantasia, and Bambi were all box office losses. Dumbo broke even, but it was designed to be super economical. Lady and the Tramp was a success. Sleepy Beauty was not. But by that point they had Disneyland, live action movies, and other adventures going on. 101 Dalmations was the first film to use Xerox copiers to duplicate the dogs and save redrawing them so many times. So many dogs. So many. The Jungle Book was Walt Disney’s last film. He died one year before it was finished. Tim Burton was a concept artist for the Black Cauldran. Due to poor management and organization, none of his concepts were used, and the film was a disaster. Burton then left to direct his own films. I’ll read the last half about Beauty and the Beast later. Maybe it’ll warrant its own post. I had a Minecraft server a while back called Minestick. It was a lot of fun, but eventually I ran out of time, and moved on to other adventures. I did, however, save a number of log snippets that I found humorous. Let me share them with you. Messages marked “Server” or “Console” were typed from the command console the dedicated server was running on. Hopefully you’re familiar enough with slash commands to know what’s going on with them. 2010-11-25 08:46:13[INFO] [CONSOLE] When I get a proper blog up, I am going to write a treatise about the psychological impact on physical locomotion restrictions regarding Minecraft players and the spawn point. 2010-11-25 08:46:21 [INFO] [CONSOLE] Until that time, live with /sethome and /home and trust me. It’s more fun. 2010-12-03 06:43:55 [INFO] Command used by DaemonKrog /tell alacerfox are you server? [CONSOLE] I beat Minecraft once. The ending was neat. 2011-01-14 05:41:30[INFO] [CONSOLE] AutoMsg: Saving. Please wait 10-50 seconds. 2011-01-14 05:41:32[INFO] CONSOLE: Forcing save..
2011-01-14 05:41:33[INFO] CONSOLE: Save complete. 2011-01-14 05:41:33[INFO] [CONSOLE] AutoMsg: Temporary world until Sunday. Will not be grafted into the old world. 2011-01-14 05:41:58[INFO] <Mitnighter> holy sit? 2011-01-14 05:42:18[INFO] <Mitnighter> is the old map? 05:42:56[INFO] [CONSOLE] You literally logged in to see the message explaining the question you just asked. 2011-01-28 01:47:20[INFO] [CONSOLE] AutoMsg: Restarting server in two minutes. 2011-01-28 01:47:22[INFO] [CONSOLE] AutoMsg: You can enter craft.minestick.com into the IP box to reconnect after restart. 2011-02-25 02:18:39[INFO] [CONSOLE] I computer. 2011-02-25 02:18:46[INFO] [CONSOLE] I computer all the time. 2011-02-25 02:18:52[INFO] [CONSOLE] I’m a pro computerer. 2011-03-09 20:17:47[INFO] [CONSOLE] Thanks for the heads up, Ned. 2011-03-09 20:17:57[INFO] [CONSOLE] You’re on my list. 2011-03-09 20:18:00[INFO] [CONSOLE] But I won’t tell you what list. 02:51:48[INFO] <§fcomi999§f§f> He will say something when we least expect it. 02:52:00[INFO] [CONSOLE] AutoMsg: Restarting server in two minutes. 02:52:02[INFO] [CONSOLE] AutoMsg: You can enter craft.minestick.com into the IP box to reconnect after restart. 03:58:30[INFO] <§fFitzChickens§f§f> The sky is falling? 18:18:36 [INFO] <SomeStayDry> out of reach? 13:49:27[INFO] <Mastaonion> was that a glitch? 13:49:34[INFO] <Mastaonion> I just randomly caught fire! 13:49:50[INFO] <Mastaonion> I’M NOT CRAZY! 13:50:07[INFO] [Server] Abuse of power is only funny when it’s not obvious. 13:50:29[INFO] [Server] Wait for another mod to be on so you’re not the only one. 13:50:33[INFO] [Server] And don’t do it repeatably. 13:50:42[INFO] [Server] Or spy on them, and do it every time they step two tiles away from lava. 16:58:20 [INFO] [Server] Judge? I’ve got a whole jury over here shaking their heads at you. 22:24:43[INFO] [Server] ‘Who’s’ is used for the contraction ‘who is.’ ‘Whose’ is used to denote ownership. 22:25:15[INFO] [Server] I grammared him off the internet. 17:44:02 [INFO] [PLAYER_COMMAND] Akran03: /r stop palying mc!! 17:49:12 [INFO] [Server] Watching a very interesting exchange in private messages. You? 03:32:26 [INFO] <linn28> you cant swin in lava! 03:33:54 [INFO] [Server] I’ve just immunized you from lava, Merlin. Try again. 03:34:20 [INFO] [Server] For the record, I am a terrible person. While reading the scriptures, I’ve occasionally come across verses that seem funny or odd. Sometimes in context, sometimes out of it, and sometimes just odd or poor word choices in translations. I’d like to share what I’ve collected so far. Being a Latter-day Saint, or Mormon, many of these versus will come from the Book of Mormon. They’re sorted by the order they appear, Bible first, then Book of Mormon. Bible translation is the Revised King James version, which is standard for the LDS church. Feel free to comment and add your own if you have some. The Camel brand cigarette is millennia old. Moses, supposedly the meekest man on Earth, has several scriptures where he goes into a rage. Such as when the Israelites get tired of eating the miraculous manna they find outside their tents every morning, so they demand meat from God. He gave it to them, but with this stipulation. A description of a murder. How a man died after having a nail driven through his temple. I think the record they were transcribing from started skipping. The prophet Elisha does not take well to being mocked. 23 And he went up from thence unto Beth-el: and as he was going up by the way, there came forth little children out of the city, and mocked him, and said unto him, Go up, thou bald head; go up, thou bald head. The proper treatment of the wicked: break their arms until they stop being wicked. Proverb’s method of educating your children is to beat them until they’re smart. History’s first recorded food fight. The dangers of falling asleep during a religious lecture. And there sat in a window a certain young man named Eutychus, being fallen into a deep sleep: and as Paul was long preaching, he sunk down with sleep, and fell down from the third loft, and was taken up dead. The prophet Abinadi was driven out of a city for preaching. Later he comes back in disguise. A disguise doesn’t last long when you quote someone saying your name. And it came to pass that after the space of two years that Abinadi came among them in disguise, that they knew him not, and began to prophesy among them, saying: Thus has the Lord commanded me, saying—Abinadi, go and prophesy unto this my people, for they have hardened their hearts against my words; they have repented not of their evil doings; therefore, I will visit them in my anger, yea, in my fierce anger will I visit them in their iniquities and abominations. Amulek and Alma converted a bunch of people. The prophets were then captured, and their converts were thrown into a big bonfire. I imagine Amulek’s voice in verse 12 resembled that of Eeyore. Now Amulek said unto Alma: Behold, perhaps they will burn us also. 2 Nevertheless, they did not long maintain an entire peace in the land, for there began to be a contention among the people concerning the chief judge Pahoran; for behold, there were a part of the people who desired that a few particular points of the law should be altered. 5 And it came to pass that those who were desirous that Pahoran should be dethroned from the judgment-seat were called king-men, for they were desirous that the law should be altered in a manner to overthrow the free government and to establish a king over the land. Helaman lays siege to an enemy held city in order to steal incoming provisions. The wording implies he takes some humor in this deception. At length their provisions did arrive, and they were about to enter the city by night. And we, instead of being Lamanites, were Nephites; therefore, we did take them and their provisions. Being on fire is good for moral. And when they saw that they were encircled about with a pillar of fire, and that it burned them not, their hearts did take courage. Book of Mormon: The Musical. And it came to pass that they did break forth, all as one, in singing, and praising their God for the great thing which he had done for them, in preserving them from falling into the hands of their enemies. The Lamanites are the ancestors of the modern day American Indians. See also: Indian reservations. And they granted unto those robbers who had entered into a covenant to keep the peace of the land, who were desirous to remain Lamanites, lands, according to their numbers, that they might have, with their labors, wherewith to subsist upon; and thus they did establish peace in all the land. This entry was posted in Church, Funny, Main, Religion. Bookmark the permalink. This will be a somewhat INTJ post. For those not familiar with the term, it basically means I’m going to say things that make perfect logical sense, but will make certain people’s hair stand on end as they think, “that’s horrible, you’re putting people into little boxes and labeling them! You can’t do that!” If you find that happening, feel free to step away from the computer, have some tea, and forget you ever read this post. While talking with a friend, he mentioned I knew how to pick friends, and asked where he ranked. And I found myself looking for a grading criteria for my friends. Some friends are better than others. They’re more entertaining, more useful, more funny, etc. But it’s a complex web. Friend Alpha might be beautiful and intelligent, but have the social skills of a skunk. Friend Beta might be horrid to the eye, but extremely intelligent and funny. Putting them into the traditional “high score” list, with a clean numerical scaling, doesn’t work well. So I examined my friends. And when I say friends, I mean the people that have had a large influence in my life, or who I try to talk to regularly. The following does not include acquaintances, heroes, and the like. What I found is that I have four major categories that I care about concerning friendship with others. These categories are as follows. This category covers the funny, attractive, and entertaining areas of a person. A friend who cuts to the heart of issues with a single sentence. He’s very abrasive at times, but the raw honesty is extremely refreshing. He’s also almost always right. A friend who does not impress me with intellect, social skills, or even looks. But is a really nice guy, and fun to hang around. I very much enjoy working. I like to get things accomplished, create, and inspire. Many of my friends were chosen, or gain additional value to me, as we can work together to accomplish some goal or another, combining our skills. An old high school friend who came over one weekend to play games. We ended up working on and finishing a big website project that weekend. A college friend who saw an opportunity to enhance products they were selling at a convention by having me use some of my tools that were lying around. One of my most valuable categories is being able to learn something from a friend. Not everyone fits into this category, as teaching is its own skill. First you need to know something well enough to be able to explain it. Then you need to have the skill to explain it clearly. A friend who taught me a significant portion of social analysis skills, to understand people, how they work, and what their goals are. Lastly, I noticed that I had a few friends whose greatest value didn’t fit into any of the other categories. People who I’ve given advice and ideas to, who I’ve been able to watch grow and progress, but don’t really give much back. Not that it’s a lopsided friendship. I love teaching. I had considered becoming a teacher of some sort when I was growing up. And watching someone take what you’ve taught them and become better for it is amazing in itself. The experiences of the teachable people are more theirs than mine to share. I just did some talking, they did the actions. This system is by no means complete, current, or accurate. It might change in five years, I might have overlooked something major, and these are all my categories. This was more of a spur of the moment pairing that made a lot of sense, based on my own tastes. If it makes a lot of sense to you, try picking a few categories of things you find most important in a person. What attributes of your friends have made you the most happy, or had the most difference in your life? If you’re aware of these, it may be a lot easier to find people whose company you’d enjoy. This entry was posted in Friends, Main, Philosophy and tagged friend, INTJ, organize, sort. Bookmark the permalink. Now I’m going to bed. 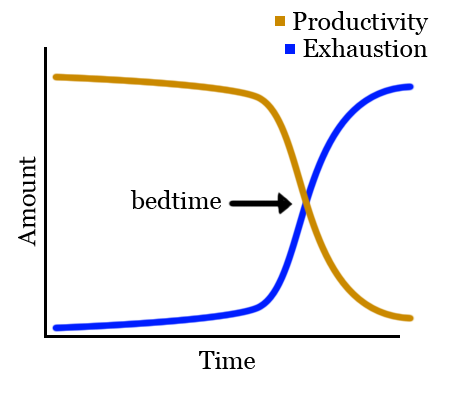 This entry was posted in Funny, Health, Main, Work and tagged graph, sleep. Bookmark the permalink.